The International Society for Technology in Education (ISTE) Conference descended on Denver, Colorado last week with more than 14,000 educators gathering from across the nation. Attendees had the opportunity to review the latest trends in technology, discuss instructional technology topics with keynote speakers and fellow educators, and sneak a peak at the latest innovations in technology to support the 21st century classroom showcased in the exhibit hall. Denver was an incredible host for the event. The Colorado Convention Center was well equipped to support the numerous attendees and traffic into the downtown area. The event was packed with enthusiastic educators, instructional technology specialists, and thought leaders in education eager to learn and share ideas. ISTE has once again provided an amazing opportunity for educators dedicated to advancing technology in the classroom. I had an opportunity to visit many sessions and visit the exhibit hall talking with fellow educators and technology innovators. A common challenge I heard from fellow educators was digital equity for all students as well as the need for seamless connectivity without wasting valuable instructional time trying to get online. And it became clear that educators have a shared desire for innovative curriculum ideas to support the highest needs students in their class. Of the numerous vendors in attendance at ISTE, Samsung Electronics America stood out among the others offering turnkey solutions to these challenges. Samsung, a Year-Round Missions Sponsor for ISTE, provided me a personalized tour of the amazing and innovative tools that are going to dramatically impact instructional technology for the 21st century. I started with the Oculus Gear VR Virtual Reality viewer. Simply using a Samsung Galaxy S7 phone and combined with user-friendly applications and I was transformed into the middle of a Cirque du Solei performance! Onstage with the performers, the Oculus provided me a 360-degree tour of the stage and performance. Just imagine the classroom possibilities with this innovative technology. You could take your science students on a virtual safari with an up-close-and-personal view of the animals of the savannah – minus the danger. Or take your history students back in time more than 2,000 years to experience the Roman Empire with a visit to the Forum or a gladiator battle in the Coliseum. The Oculus Gear VR is going to be a game changer in education, providing unparalleled experiences for students. This will be particularly valuable for schools that may not have the financial means to support field trips or museum visits. Now teachers can provide a virtual opportunity for their students right from the classroom. I also had a chance to experience the Digital Signage and Interactive TVs that Samsung offers. These interactive board displays completely replace the whiteboard, projector, and document cameras relied on by many teachers. The interactive screens allow teachers to pull content from the web, use their finger or a stylus to write on the screen, and use a variety of built in tools to highlight and share content with students. The best part about the interactive screen is the seamless share functionality with bring-your-own devices used in many classrooms. The teacher can share the screen with any device in the classroom regardless of operating system. This includes cell phones, tables, laptops, and desktop computers. Teachers can share the screen with the student and give control of the content to the student. Schools can also utilize technology integrated with the interactive screen to produce announcements, videos, and other content that the district would want to share with every classroom with the interactive screen. This screen takes teaching to another level. Teachers can pull online content and share it seamlessly with any student, saving time and lesson planning. It also makes a great tool for those teachable moments that inevitably come up during classroom discussions. This is going to be a staple in future-ready, 21st century classrooms. As a school administrator and advocate for technology in our classrooms, I understand the importance of providing students and teachers with access to the latest innovations and solutions available for our schools. But if the connectivity in the school is limited, outdated, or non-existent, these tools are nothing more than expensive paperweights. 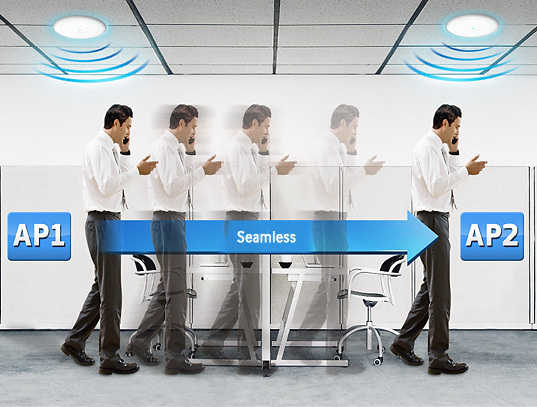 I know from experience that while some providers do a decent job of providing the wireless tools to get campuses connected, Samsung Wireless access points can provide ubiquitous connectivity throughout the campus. The wireless connectivity is seamless, easy to use, and reliable. If you are making decisions for your school or school district, you want to be able to trust that the products you purchase with taxpayer dollars will enhance the learning experience for students in your district. I have no doubt that Samsung is working hard to provide these solutions for school districts across the United States with a great showing at ISTE in Denver.